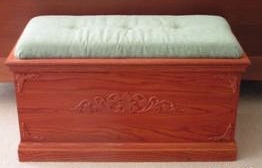 Fearon's fine woodworking is proud to showcase the beautiful woodwork created by Dennis Fearon. Dennis is a highly skilled craftsman who specializes in fine wood furniture and other custom woodwork. Dennis has been creating beautiful custom furniture for more than 24 years. "Custom Furniture without the custom prices!" Fine furniture built to last for generations! Dennis crafts custom kitchen nooks, wall units, desks, mirrors and much more! Call him for a quote. Various fonts used were provided by: dafont.